Our sweet pup turned six this month and we threw a little doggie birthday party! We made a dog birthday cake for the event with really fun dog treat birthday candles to top the cake. 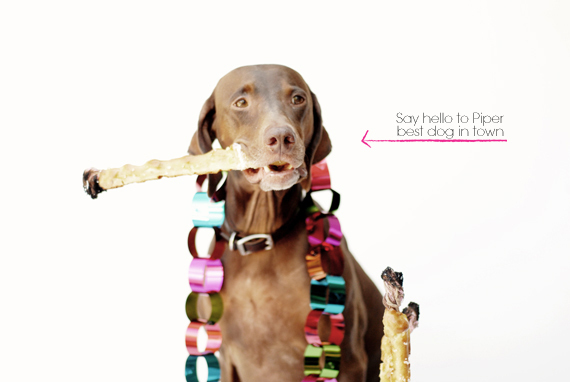 Perfect for celebrating our favorite pup around! 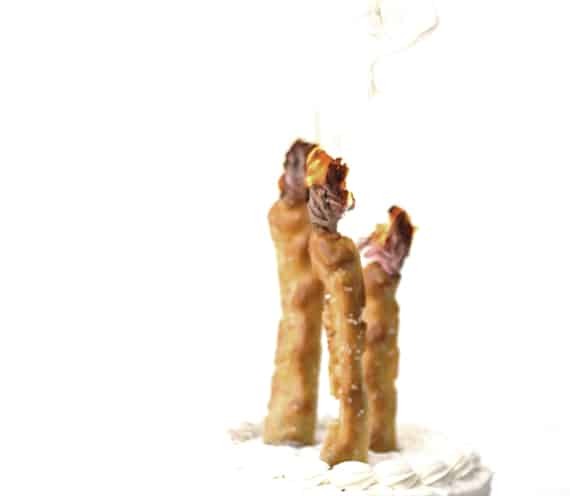 These doggie bone treat candles make me just giddy. I mean a birthday cake for dogs! How could you go wrong with that? 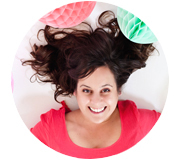 Why Make Your Dog A Birthday Cake? The dog birthday cake was easy to make and the candles are especially fun to light and sing around. Once we cut off the charred end they became an eatable present for our family’s loyalest friend. Along with this dog birthday cake recipe which is totally safe for your pup to eat and made out of her absolute favorite things. I mean, why should only us humans have our favorite sweet treats on our birthdays. In my book our dogs should get just as much sweet tasting fun as they turn another year old. Plus, It’s just super fun for the kids to get to sing and give presents to their favorite 4 leg pup. In case you need a present idea, this is our dogs favorite toy ever. 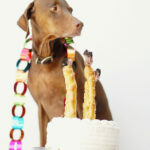 Birthday cake for your dog with special dog treat candles! Preheat oven to 350°F. Combine flour and baking soda in one bowl. Mix the butter, oil and eggs in a separate bowl. Stir the sweet potatoes, squash or whatever veggie your pup likes the best. Feel free to stir a little bacon into the cake as well. I mean it is a cake made for dogs after all! Add the dry ingredients to the creamed mixture and mix to combine. Bake in a small cake pan for 25 minutes. Allow to cool. While the cake is cooling whip all frosting ingredients together for a sweet topping to this new favorite dog friendly birthday cake. 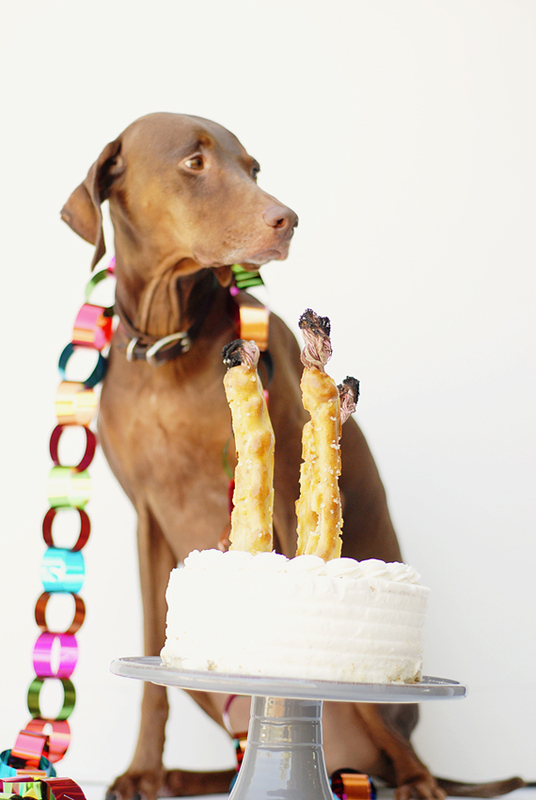 To make the dog treat candles to top off your dog birthday cake, you’ll start by breaking apart a thick rope toy into smaller rope sections and wrap them individually in the dog pretzel dough. Leave about an inch of rope sticking out of the top and cover the rope with tin foil while baking. 1. Mix well and kneed on a hard surface until your dough becomes a bit more firm. 2. Place ropes in the dough and roll the pretzel around the rope, leaving a little rope out on each end. Bake 350 for 15 minutes, or until golden brown and firm. My pup’s birthday was last week – he would’ve LOVED this! How adorable–one more reason to get us a pup! My dogs birthday is tomorrow and Tess is so excited and so am i! !